The Bike Co-op is proud to announce two Fort Collins screenings of the feature length documentary With My Own Two Wheels. Two Wheels weaves together the stories of five individuals across the globe into a single narrative about the bicycle as a vehicle for change. The documentary was shot on location in Zambia, Ghana, India, Guatemala and California. Each screening will be followed by a question and answer session with the Producer/Co-director of the film Jacob Seigel-Boettner. The screenings will take place at 7:00pm on December 7th and 8th at The Lyric Cinema Cafe. 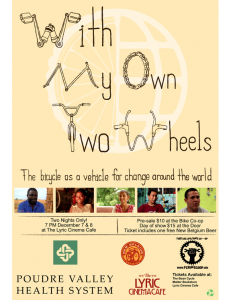 Tickets for each night can be purchased before the event for $10 at the Bike Co-op or The Lyric Cinema Cafe. Tickets will also be available at the door for $15. Seating is limited, so buy your ticket early. Each ticket purchase includes a complimentary New Belgium Beer (For those of legal drinking age). Hey, $10 for a movie and a beer! Just try to find a better deal. Sponsored by Poudre Valley Health Systems and New Belgium Brewery. This entry was posted on Monday, November 21st, 2011 at 9:38 pm	and is filed under Advocacy, Events, Fundraising. You can follow any responses to this entry through the RSS 2.0 feed. You can leave a response, or trackback from your own site.